Cindy mentioned braving the dreaded under bed clutter in her daughter’s room in a comment last week. She likened it to cave exploring. I recently performed the same task on my own bed and seriously, is it any wonder I have been having sinus issues lately. The dust bunnies have been breading like rabbits under there. A souvenir baseball bat from Cooperstown. An art satchel containing framing mat board. A large picture frame that I bought at a garage sale for $5. A box of winter clothes. I removed all the slats from the bed frame and did a thorough vacuum of the area and the things I had pulled out as they were also had a liberal coating of dust. Then I thought I had better address the items that I had pulled out. This belongs to my son from when we visited Cooperstown in the summer of 2002. I moved it down to the “shrine to baseball in the corner of our living room where it could be on display like it deserves. I took the opportunity to mat and frame several pieces of my son’s art work and a couple of other items that my husband had been nagging me about for some time. When I was done I put the satchel and cutter back under the bed because they need to be stored flat or they could warp. Even though I do not use these items often they have more than appreciated their cost over the years. With a budding artist, a mad crafter and everyone in the household keen on one sort of photography or another these items will get used over and over again in the future. I am glad I bought them, am happy to store them until they are needed again and do not consider them to be clutter. This was a piece of bargain clutter that has now been hiding under my bed for about seven years. I have left this one out to contemplate for now. I see it every time I go to do some crafting or to my bedroom. It is starting to irritate me because it is now in a position that renders it as messy out of place clutter. It is such a great frame though and I hope before I finally give up on it that I will find just the right photo to put in it . One thing is for sure it is not going back under the bed. Mostly this box is full of woolly knitted scarves and beanies better known as obligation clutter because my mother made them for me but in all honesty I rarely find the need to use them. There are a couple of pashminas that I do use that could be stored somewhere else but since my husband’s leather overcoat is in there they may as well stay together. My husband did remove one other overcoat that really is excess to his needs now that we no longer live in a cold climate and he is considering the best option for finding a new owner. All in all this box is OK for now but it is now on my radar for future decluttering. As you can see I didn’t actually declutter any items but I am certainly going to consider some of the things that came to light during this clean up. As you know I am not one for rushing into things and would rather contemplate them for a while and decide what should stay and what could go. I dare say the scarves and beanies will be the first things to find their way to the thrift store donation pile but this can wait until winter when they will be most useful to someone. They are not harming anyone under my bed and are not cluttering up valuable storage space at the thrift store. 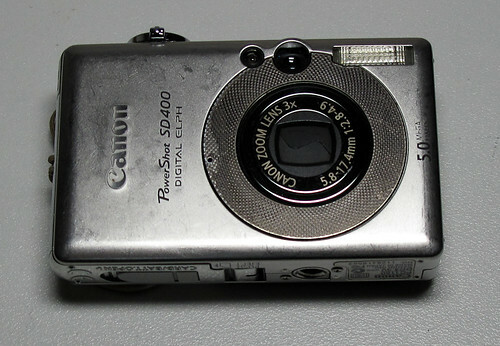 This camera was one that I used to have on me at all times but it’s display screen mysteriously got broken. 🙁 . That didn’t stop it from selling on eBay for $12.50. Public holidays – Even though I don’t work it is nice to have hubby home for one extra day in the week. Getting together with the neighbours – Yesterday was Australia Day and I arranged a get-together for our little neighbourhood in the form of a BBQ in the evening. It was a good chance for the new neighbours to meet everyone and to welcome back some old neighbours who have moved back into the area. Having fun with my husband and children – even if we are just taking the mickey out of each other. Feeling free to do things my way no matter what other people think. « What Kind of Clutter is That? This post reminded me of that one episode of Winnie the Pooh where they venture under Christopher Robin’s bed and get attacked by dust bunnies and there is a LOT of stuff. It was scary. I bet it feels great to have gotten that done! woooot! I cleaned out mine a while ago, but there is still a bin of legos under it. *shifty* Guilty pleasure. it was pretty scary under there I must admit considering that those dust bunnies I imagine mostly consist of goose down and dead skin cells it is pretty gorse. I am glad it is done though. Enjoy your legos, we are all allowed at least one guilty pleasure. I love your term “obligation clutter”. I certainly can relate to that. I’m always battling myself over what to do with that kind of clutter. To stay or to go? I don’t want to hurt anyone’s feelings. I like to work on the idea that maybe the person that gave me the clutter item wouldn’t care less anyway and the only person I am hurting is myself by keeping it. Why should my feelings take precedence in my own home. This would make great extension work for those over-achievers who do their mini-missions in one go, wouldn’t it??? Just teasing! Er, I mean, taking the mickey out of everyone! They’d get extra credit, wouldn’t they? I have a Craftmatic bed with the mecahanism that drives it hanging under the bed. It makes it impossible to put anything else under there. I’m so glad because if it was available my mother would want to use it. Grin. In my bathroom I had the miniscule tub/shower combo taken out. I now have that space free. I am wanting to put a small dresser or chest of some type there but am having a hard time finding one that isn’t too big but big enough to do what I want with it. My mother was talking about all the things we could store in there and I cut that off at the knees. NO WAY!!!! We are not going there. I have this very small plastic 4-drawer unit in my closet that holds my underwear. I want to move it all out of there and put it in this new unit in my bathroom. Once I do that the shelf in my closet will have only my sunhat on it. There is NOTHING on the floor. I just love my decluttered closet and bedroom. Ahhhhhh!! Clara has a trundle bed, and she had a friend spend the night, so the lower bed was pulled out. I just pulled it out further, but it really was like going into a cave, since her bed’s about 2 1/2 feet from floor to the bottom part of the frame. There were many, many dust bunnies and all their kin, plus a couple of thin books, a greeting card, a photo, and a couple of tiny toys, pens, and pencils. Basically, anything skinny or small that might slip off the bed becames lost until an excavation can be launched because no one can reach all the way down the side of the bed to the floor. To get under there, you have to move the night stand, pull out the bed, and crawl under. Only library books get retrieved promptly. On the plus side, it’s an attractive and comfortable bed, and it’s wonderful to have room for friends / sister to sleep. Audra’s bed is like an eddy in the water – all the trash in her room seems to end up in the far back corner. It probably doesn’t thelp that the cats like to play under her bed, and sometimes they drag stuff along with them. It can get yucky under there, but it’s much easier to clean than Clara’s set up. I recently cleaned under my bed, as well, and was astonished by how extremely clean it was. I don’t store anything under it, including dust bunnies, it seems. I must be a better housekeeper than I’d realized! Good job getting under your bed Colleen! I like your descriptions of the girls under bed space especially the eddy. When I lived in the US I have my iRobot vacuum cleaner and it would do a lovely job of cleaning under my bed every week without any help from me. It was great and I miss it. One of my aims is to have nothing under any beds in the house when my decluttering mission is complete. I am well on the way to that. I do miss my Roomba, and more so, its friend Scooba. Yes my roomba (Rupert) served me well. I used to store vintage suitcases under my bed and had a dust ruffle hiding them. One day I moved the suitcases and took off the dust ruffle and can now see all the way under the bed. The bonus is that every time I sweep or vacuum my bedroom floor, under the bed gets done too. I love the clean lined appearance of my less cluttered-with-linens bed and that dust bunnies don’t have a chance to unionize. Yes, I did display them. I have just three so not too many. I am storing extra totes, purses, and backpacks in one of them. With four children still at home, it takes a few bags when we travel. We also use tote bags when we visit the library. This is a common feng shui advice – not to use the area under your bed for storage, it has to do with the free flow of energy. It did make sense to me when I read it the first time, I personally always preferred it that way – empty. When I was growing up, my under bed area was reserved for dust bunnies mainly. Today, in my own grown-up bedroom, we have one of those divan beds with 4 large drawers. This was intentional (and as I once believed – clever) buy, I believed in never having too much storage. However, I never liked the bed for the same reason why I bought it – somehow, that whole bottom part feels heavy, if it makes any sense – and nowadays I’m working towards emptying the drawers and moving their content to the other areas, or getting rid of some stuff altogether. 2 down, 2 more to go. When the opportunity presents itself, the bed frame will be replaced with something more elegant and definitely drawer-free! well thank you for that little lesson in feng shui. I have never paid much heed to it but I often discover that by accident I live by some of the guidelines of it just because it feels right. Just as I often find out that things I feel are not right about my house break the guidelines. I should look into it further now that I am getting my clutter to a level that I can easily adapt to it. since I moved here, I keep the space under my bed clutter free. when I was living with flatmates it was the place for moving boxes, it was ugly and dusty and annoyed me everytime I had to clean the room. (we never owned a basement or attic storage). I am so happy now, I can easily vacuum clean under the bed, I dont have dust bunnies (in bavarian those are called “the dead”). I have the feeling the whole room feels nicer maybe because I picture air circulating better… feng shui is for sure right in some cases. Although I still have a few things under beds I know exactly what you mean about feeling better because you picture the air circulating better. I feel like the air is cleaner once I am done cleaning house on a Monday. There is a lot to be said for feng shui and there is a book about it awaiting me at the library that I must go and pick up. I have never really read up on the subject but at times I think perhaps I am complying to its rules just because some things just feel right placed a certain way and in some case removed.